Why Spitting in Public Earns a $100 Fine - Video of Member Florence Stahl talking about how the ordinance came to be. St. Patrick's Day in Muskegon: Parade, green eggs and ham breakfast highlight celebration. 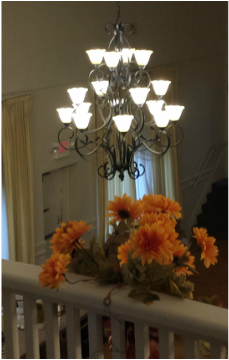 In October 2014, eight new energy efficient, period appropriate chandeliers were installed by D.E.I.R. Electric. They added new elegance to our Ballroom that had been sorely lacking. They also seemed to breathe new life into the membership, as a new sense of pride and excitement surfaced about the Club and the Clubhouse. For a long time, the Greater Muskegon Woman's Club has wanted to update the lights in the Ballroom. The old lights, which had been installed sometime before the 1960s were not period appropriate for our historic 1902 Edwardian building. They also were not energy efficient, and very soon the incandescent light bulbs they required were no longer going to be made. That's why we applied for a grant from the Community Foundation for Muskegon County. We were honored and delighted when our grant request was approved! We would like to thank the Louis E. Jr. and Ann J. Eklund Renewable Energy Fund of the Community Foundation for Muskegon County, D.E.I.R. Electric, and everyone who donated financially or with their time to this project for making this possible. Currently on display in our Tea Room. The Greater Muskegon Woman's Club has help more than 6,000 individual families with their philanthropic efforts. Collections are taken for different charitable organizations at every membership meeting. 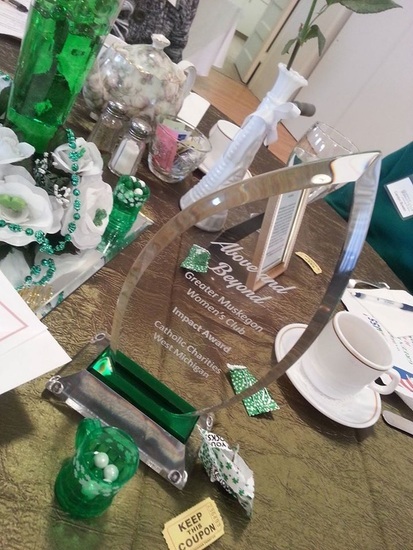 Our efforts were recognized by Catholic Charities of West Michigan with the "Above and Beyond Impact Award", which they presented to the Woman's Club on March 5, 2014, and accepted by Carolyn Bowen, our Philanthropy Chair. We're very proud and honored to received such an award, and we plan to continue our efforts to service the community. One of our founding principles is that of helping the community through volunteerism and charitable giving. One of our ongoing goals is to partner with other non-profits so we can further our reach in helping the community. We are always interested in expanding our philanthropic activities. Please contact us, if you are looking for volunteers to help with a charitable event, or if you would like your charitable organization considered to be included in our charitable contributions.